THE Australian grainfed beef sector contributes $4.4 billion in value to the nation’s economy, supporting 31,000 direct and indirect jobs, mostly in regional areas. 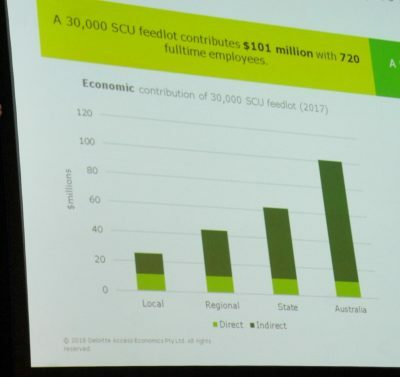 These are some of the bottom line figures produced by an independent study of the feedlot sector’s economic impact released at the grainfed sector’s BeefEx 2018 conference in Brisbane yesterday. Deloitte Access Economics partner Daniel Terrill’s analysis looked not only at direct feedlot numbers, but also what impact it has on flow-on activity and wealth elsewhere in the Australian economy. The study (click here to access the full report) was an update to previous projects, which looked at similar metrics in 2014 and an earlier period in the industry’s history. Results were based on feedlot operations during the 2017 year, when the grainfed industry accounted for turnoff of 2.89 million cattle, with feedlot utilisation averaging 80pc. A record 40pc of slaughter cattle last year were presented via the feedlot industry. Since 2000, that figure has been at least 30pc. What use does such a report have? 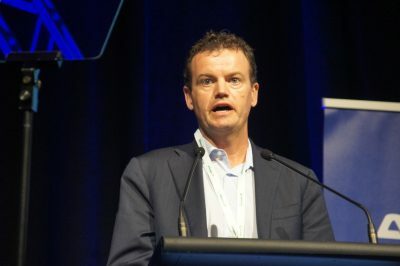 “It can be used to support the development of a new feedlot, it can be used in policy advocacy, and it’s particularly powerful in this day and age where industries and entities are having to demonstrate social license to operate – because we are talking about an industry that in certain environmental and animal welfare grounds does not always get the best publicity,” Mr Terrill told conference delegates. Backgrounding the study, Mr Terrill said the lotfeeding industry was an “exceptionally low margin” industry, with an “exceptional reliance” on just two inputs – cattle and grain – which together account for 90pc of production costs. Direct employment by the industry of just 1800 staff certainly did not reflect the economic value of the industry, and reflected the fact that lotfeeding was not a particularly labour-intensive industry. Within the existing feedlot sector, the study found a ‘direct’ contribution to the Australian economy worth $500 million each year, with an additional $3.9 billion being the sum of the contribution outside the immediate feedlot industry, through the economic multiplier effect. “In the feedlot industry’s case, we are talking about $7 being generated for every $1 of direct activity within the feedlot industry – that’s way above the rest of the economy, which averages one-for-one,” Mr Terrill said. The $4.4 billion total economic impact revealed in the study was ‘significantly higher’ than the figure generated in the same study in 2014, he said – partly reflecting higher costs (ie. feedrain and cattle), but also higher returns. In a second part of the study, two scenarios were created for the economic impacts from a 30,000 head SCU feedlot, and a 5000 head feedlot near Goondiwindi. For the 30,000 head yard, the local contribution (within 75km) was $22 million a year, extending out to $61 million within the state of Queensland and $101 million nationally. For the 5000 head yard, the overall annual contribution was estimated at $25 million a year. The study also looked at the economic impact of establishment of a new 15,000 head feedlot near Goondiwindi. Mr Terrill said the construction phase would typically deliver an immediate $17 million ‘sugar hit’ to the local economy, generating employing and ancillary services. During the operation phase, the overall economic impact would be $25 million per annum by 2029, the study found, employing 100 additional staff, both directly and indirectly (net). What would the national economic impact be if the lotfeeding sector ceased to exist? The report also attempted to model this scenario. “We’re talking about bigger shocks here: it’s not just taking away the feedlot industry, we’re asking what does that do to the grazing industry; the processing industry and others. Some of the earlier economic contributions totally missed some of the economic value of feedlots to other sectors,” Mr Terrill said. As a result, Mr Terrill’s study suggested Australia’s national gross domestic product would be $10.3 billion smaller, annually, by 2029, if feedlots did not exist. “That’s huge: it represents 0.5pc of national GDP, which dwarfs the sector’s direct revenue and contribution,” he said. Under the same scenario, the economy would lose 49,000 full time employees by 2029, without the contribution of feedlots. Meat processing would be the ‘biggest financial loser’ in the event of disappearance of the feedlot sector. Click here to access the full Deloitte report.